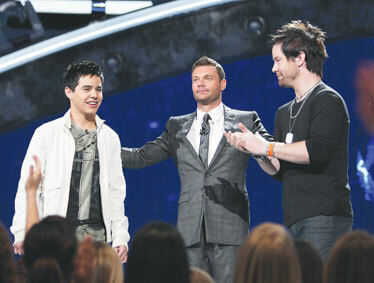 Ryan Seacrest, center, presented David Archuleta and David Cook, the last two standing on "American Idol" last week. In the days of the ancient tribes, in tales told in the flickering magic of campfires, the big face-off was between David and Goliath. But that was, like, so then. Modern parables celebrate the average guy, not the giant. On today's level plain, the competition is between David and David. Old Testament smackdown or "American Idol"? Things change. And not only do the competitions evolve and mutate, so do the ways in which we perceive and process the information. A trio of communications scholars has discovered a link between reality shows such as "American Idol" -- hey, the final countdown begins tonight -- and the way 'Net Age citizens view the world. "The Internet has revolutionized the way that we interact with information, and transformed the way we each communicate with others," mused University of Hawaii communications professor Devan Rosen, who, with University of Buffalo scholars Michael Stefanone and Derek Lackaff, have authored "We're All Stars Now: Reality Television, Web 2.0 and Mediated Identities" for an upcoming conference called Hypertext 2008. "Generations growing up in this new knowledge environment are developing an ability to pay attention to all of these parallel communication channels, as well as comprehend their connection to people experiencing it with them. The experience is ephemeral, but the affect is persistent," said Rosen, who also noted that kids diagnosed with Attention Deficit Disorder might simply be adept at juggling simultaneous communications threads. "It is not uncommon for a teenager to be surfing the Web, composing an e-mail, managing several instant-message conversations, watching 'Idol,' voting and researching their homework all at the same time. Media producers know this, and tailor their delivery accordingly." It's adding up to a new mode of communication, one in which audiences are no longer passive absorbers, but actively engaged. Media programming, then, "can be decided by the many instead of the few," Rosen points out.
" 'American Idol' is a version of this, as is MySpace. In the past, a privileged few decided who was worthy of being a superstar -- now millions of individuals can connect to a band's MySpace page and catapult them to fame, or text in to 'Idol' and decide who is the next mega-star," he said. "For the first time in history the power may be coming to the people, and that makes the old school of government and business very uncomfortable, which leads to panic in the boardroom." And so, when you text in your vote tonight for David, or the other David, raise a fist. Viva la Digital Revolucion! » In brief: Donny Osmond redux. » Strengths: A beautiful, nuanced vocal style. He's Teen Beat cute. And he evokes golly gee whillikers humbleness and sweetness. » Weaknesses: The ubiquitous presence of his stage dad (recently banned from rehearsals) exacerbates the image that he's a puppet with no mind of his own. He struggles with modern, faster-paced songs, e.g. Chris Brown's "With You" last week. He can overdo the vocal gymnastics, a common "Idol" affliction. » Odds of winning: 4 to 3. » In brief: Daughtry with more soul. » Strengths: He can take standard pop songs such as "Hello" and "Always Be My Baby" and turn them into stirring, emotional revelations. He usually does the Nickelback growly routine but, as was proved during Andrew Lloyd Weber week, he's far more vocally flexible than he appears on the surface. » Weaknesses: He isn't going to win any hotness awards. And his attempt at sexing it up with a Duran Duran song two weeks ago fell flat. Some critics take his nonchalant confidence as arrogance. » Odds of winning: 3 to 4.